German substantive criminal law has been influential in many civil law countries, most notably in the Hispanic world. In the common law countries, not surprisingly because of the systemic differences in approach, its impact has been much less, if not negligible. This may be largely explained as a result of the language barrier. An up-to-date and reliable English translation of the German Criminal Code has been conspicuously missing for some time. This book presents a new English translation of the Strafgesetzbuch, (the Criminal Code), in its most recent amended form of August 2007. 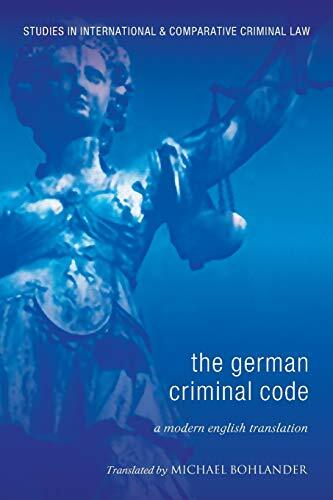 The Code is the centrepiece of German substantive criminal law and informs the interpretation and application of any other criminal provisions which can be found in specific legislation. The translation thus affords an opportunity to profit from a legal tradition that has had a major influence over history and has a rich experience of doctrinal analysis. The translation adheres as closely as possible to the textual structure of the original, but has been made palatable to an English ear. It is intended as a companion to the author's Principles of German Criminal Law which was published in December 2008. Michael Bohlander had been a member of the German judiciary for over 13 years before he joined the Department of Law of Durham University in 2004. From 1999 until 2001 he was the senior legal officer of Trial Chamber II of the International Criminal Tribunal for the Former Yugoslavia. He is the editor-in-chief of the International Criminal Law Review, the General Editor of Studies in International and Comparative Criminal Law, a member of the editorial board of the Journal of Criminal Law and a co-editor of Beiträge zur Strafrechtswissenschaft, a German series of monographs on criminal law. He has published 6 books and monographs and over 100 book chapters, articles, essays, case comments, book reviews and notes. From Czech Republic to U.S.A.